According to Hot Rate® Hotel data from Hotwire®, summer travel will be most affordable during the last two weeks of August this year. The middle of September offers big savings on hotels in most major U.S. cities as well, a perfect option for those who prefer a late summer getaway. 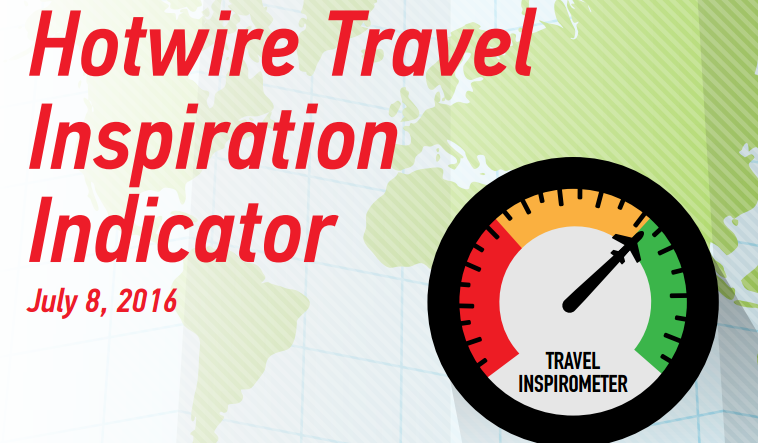 These are just two of the insights in this issue of the Hotwire® Travel Inspiration Indicator, a quarterly guide for media that includes travel trends, deals, and inspiration for “slightly adventurous” trip takers. According to Project: Time Off, more than half of American workers had unused paid leave at the end of 2015, resulting in up to 658 million wasted vacation days. At Hotwire, we refuse to let summer vacations become a thing of the past… but we might need to redefine what they look like. More weekend getaways. More short trips to see family and friends. And more spontaneous travel moments. That’s the ticket for summer travel 2016. Here’s how to make the most of it. The list below represents the best weekends to travel during the summer months for big savings, starting with the most affordable weekend first. See PDF link below for access to the complete graph. Traveling by car? Check out these 10 cities for the best deals on rentals. Gas prices are still low, so why not rent a car? Last year, travelers could start a summer road trip from $13 per day*** for these cities. Perhaps it’s time to rethink Las Vegas as the iconic destination for spontaneous travel. According to Hotwire data, these five U.S. cities actually see the most hotel bookings within two days of arrival in July, August, and September. From beach days and BBQs to touring national monuments, we recommend these four U.S. cities for families. All four have especially low prices in the summer months. When it comes to great places for a getaway with friends, these five cities boast bars, sports, and a bustling city life… as well as lower-than-usual prices on hotels during the summer months. Travelers who want to avoid the crowds during summer 2016 should check out these three cities, which traditionally offer low hotel rates during the summer months as well as great food, art, festivals, and culture. Hotwire encourages travelers to stay through the weekend and explore a new city after a sales conference or business trip. Convention-friendly cities with great summer deals include the f ollowing. Take advantage of the last official weekend of summer. These U.S. cities offered three to five star rooms from $70 a night** during Labor Day Weekend 2015. Check out off-airport rental locations. Airport fees and taxes in some locations can drive up the final price of your car rental, so it’s best to shop both on and off-airport locations to see where the low prices really are when you total up the costs. Pick up on a Friday or Saturday and return Sunday or Monday. In the summer, business travel slows and leisure travelers head away from the city to enjoy outdoor trips. This drives big city hotels to offer extra savings if you’re looking to plan a staycation. If you can handle the heat, expect to find great deals on lodging in warm locations like Las Vegas, Phoenix and Dallas. Warm weather markets generally have the best deals during the summer months. Sundays are typically the least expensive day of the week. Include a Sunday as part of your stay and save on lodging costs. Consider booking a cheaper flight to a smaller airport and then driving to your final destination. Based on historical data, you can rent cars from $13 a day*** in many cities. This can be a great money saver. If you’re booking airfare, check prices on Monday evening and Tuesday morning for the lowest prices. When traveling cross country, try to book red-eye flights to enjoy big savings. Not only is the flight cheaper, but you will be able to add another day of exploring. Here are some additional trends that will impact travel this summer. Long summer days lead to spontaneous nights with more than 25 percent of the Hotwire mobile app transactions happening after midnight. A classic American road trip will be hard to beat this summer. AAA reports gas prices are currently at the lowest average since 2005 while 70 percent of consumers say gas prices are very/somewhat important to travel decisions (SOURCE: Adobe). On average, Americans are planning three weekend trips this summer with journeys to the beach cited as the most popular getaway (SOURCE: American Express). Everybody loves to celebrate a birthday! The National Park Service turns 100 on August 25 and 21 percent of Americans plan to visit a National Park this summer for the centennial (SOURCE: American Express). Hotwire.com inspires spontaneous travel through Hot Rate® deals. Launched in 2000, Hotwire, Inc. obtains deep discounts from its travel suppliers to help travelers book unsold airline seats, hotel rooms and rental cars. Hotwire.com is an award winning website and Hotwire, Inc. is an operating company within Expedia, Inc. For more information, visit http://www.hotwire.com. ©2016 Hotwire, Inc. All rights reserved. Hotwire, Hotwire.com, Hot Rate, Hotwire Travel Inspiration Indicator and the Hotwire logo are either registered trademarks or trademarks of Hotwire, Inc. in the U.S. and/or other countries. All other trademarks are the property of their respective owners. CST # 2053390-40. * Prices based on a one to three night stay at a 3 – 5 star Hot Rate Hotel. Heat map above reflects average prices from July 1, 2015to September 30, 2015. Prices do not include taxes and fees. Hot Rate Hotels are different from retail hotel rates. With Hot Rate Hotels you enter the date, location and star rating – exact hotel shown only after booking. All bookings are final. **Prices are based on 3 – 5 star Hot Rate Hotel rates found during July 1, 2015 – September 30, 2015. Prices do not include taxes and fees. Hot Rate Hotel rates are different from retail hotel rates. With Hot Rate Hotels you enter the date, location and star rating – exact hotel shown only after booking. All bookings are final. Prices are dynamic and subject to change. ***Prices based on Hot Rate car rental rates found during July 1, 2015 – September 30, 2015. Prices do not include taxes and fees. Hot Rate Car Rental rates are different from retail car rental rates. With Hot Rate Car Rentals you enter the dates and location – exact Car Rental shown only after booking. All bookings are final. Prices vary based on car class, location, and availability and are subject to change.